This fantastic Banana Chocolate Chip Muffins recipe came from “The 30-Day Vegan Challenge.” Beforehand, I was not sure what to expect. However, Colleen Patrick-Goudreau has never let me down. 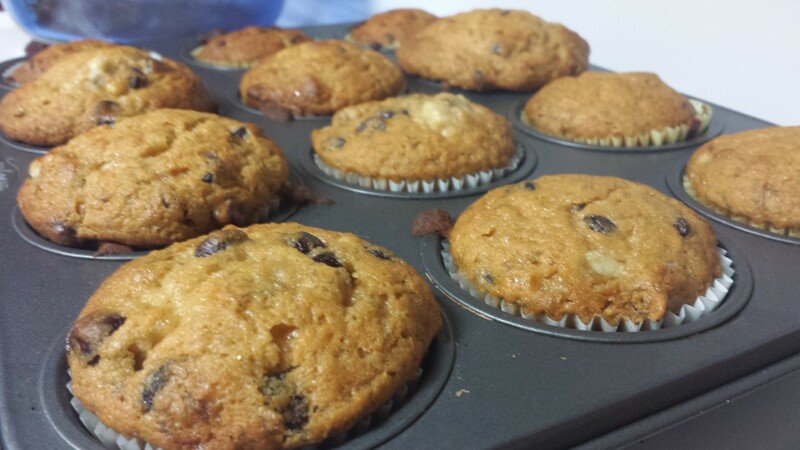 This still stands strong with these amazing Banana Chocolate Chip Muffins. In fact, I was completely blown away by my first bite. I also loved it only took a few minutes to prepare the recipe. Bake for 20-30 minutes, until they are golden brown and a toothpick inserted comes out clean. Alternative: You may just peel the bananas, break them into a food processor, and puree them along with the sugar and oil. Add the water and vanilla, then transfer to a bowl. Stir in the flour combo, and add the chocolate chips. Chef’s tip: Reduce the sugar a little and add walnuts instead of chocolate chips. My note: I filled up 12 muffin cups and added some to a small loaf pan. The small loaf pan is a great alternative to create Banana Chocolate Chip Bread.